From the main menu select "(...)More-> Credit notes (Sales) -> Add". Unlike debit documents, here you can link related invoices/receipts, and they will appear on the official document. Through the "Related documents" field, select the document to which the credit applies. The other difference is that the payment of a credit document always refers to the refund of the customer for an already paid off sales document. 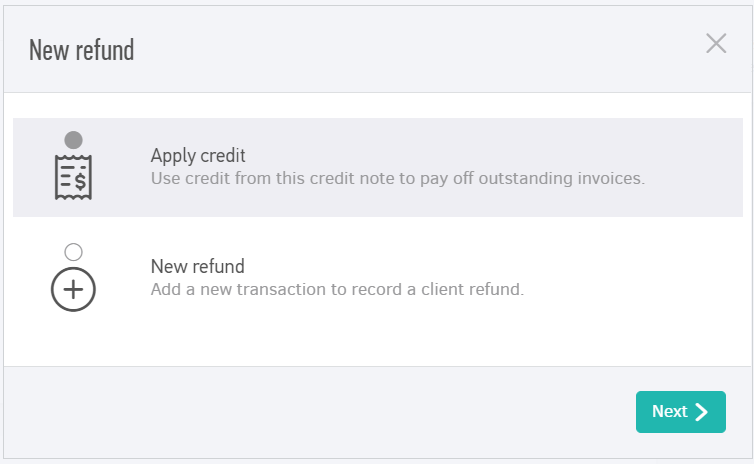 Therefore, when you add payments to credit invoices/receipts you create an expense instead of a revenue. Caution: In order for the customer's balance to be right after a refund you have to reconcile the credit note's value with the value of the invoice. This can be done by adding a payment, either from the sales document view page or from the credit note's page by selecting "Apply credit". Just like with any other document in Elorus, you can create multiple series of credit notes, attach other documents and view helpful reports. Suppose you have issued an invoice and your customer returns part of the order back prior to payment. You need to issue a credit note for the returned items and also reduce the customer's balance in the system. This can be done by reconciling the amounts of the debit and credit documents by entering a new payment using credit. It does not matter whether the payment will be made from the invoice or the credit document view page. In our example the sales document has a total value of £1,440.00 and the returned items cost £1,200.00. Select Apply credit and press Next. The system will fetch you any credits to associate with the invoice. Clicking Save, Elorus will pay off the credit note an will reduce the invoice's due amount. If the sales invoice is already paid, then you need to choose "New refund" , as you are returning the amount received for the returned products. An invoice or bill "on credit" does not have the same meaning as credit sales/purchase documents. The documents on credit are documents indicating that the payment will be made in the future and not upon delivery. 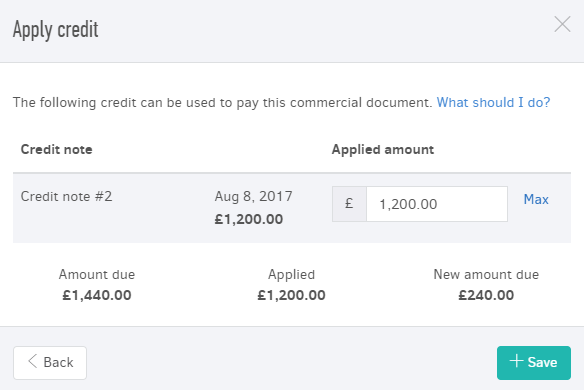 In order to save time, you can add a credit note through the sales document page to which the credit is referred. Just click on (...) and then select Create credit note. Next, you are taken to the credit note's add page where the sales document is automatically set as a related document, and the amounts are pre-filled to save time. However, at this stage you can edit all the fields of the document if you want. By saving as issued, the credit note is automatically issued and paid off if the invoice was unpaid, using the due amount from the invoice. In other words, it automatically creates the payment transaction by applying credit, just like we described above. If the invoice has already been paid, you will have to pay off the credit note manually by adding a new payment.